Your gallery is simply amazing and beautiful! I was going to install it to my web-site and tested it on all devices including iPhone and iPad, and all was working just fine. But a few days ago new system update from Apple changed it… thumbs scrolling doesn’t work any longer on iPhone and iPad. Can you give me any advice on how to change the files to make in working again? Thank you! I was just wandering whether this is theoretically possible: I have tried to do this but didn’t succeed. Is it possible to add to this gallery the vertical, basically folders? When you mouseover any picture in the horizontal scrolling slideshow, the vertical scrolling stripe with photos above it appears. This would be a great solution if you need to insert a lot of photos sorted into galleries or albums. Can somebody explain me how I can do that? *I cannot scroll the images in the gallery – this is what i meant above. Thanks. Malihu, I cannohe gallery to scroll the images in the gallery if they are bigger than the screen and when maximized. What should I add, so that I can scroll and see the whole image? Thank you for your contribution to the web design community. This gallery you made is beautiful. I just want to point out an issue I noticed where people can easily download all images with just a click using Firefox and videodownloadhelper. It’s kind of strange because I thought such programs worked only with flash video but it seems to work on this gallery here. I wonder if anyone here knows of any way to prevent such apps as mentioned above from downloading all images that easily. As with Malihu, I know you are extremely busy with life but just giving you the heads up! Thanks for the contribution and thanks for your time. I need to add social sharing buttons on each image of the gallery. I’m not able to do that! I would like to use your gallery and i already tried to modify it for my interests but there is one thing i still struggle with. I want to place my own content over the gallery – means itself is on the background so i don’t need the thumbnail-frame and would like to delete it. How can i make it without crashing the whole thing? In addition, when i place new divs he won’t show any styles and texts in them. Only pictures. How is that? Hope you can help me. I would like to know where it is possible modify the code to limit the gallery specified sizes. Ideally, the maximize button displays a gallery of a given size to full size and back. Is it possible to put this on a website but still keep your nav bar at the top? I’m currently finishing an update on this gallery which among others, will allow you to place multiple galleries, wherever you want in your page. I’ll publish the new version in a couple of days. Oh, that is great! Thank you so much. Hi again Malihu , did I already tell you that your work is wonderful ? Thank you so much for those . 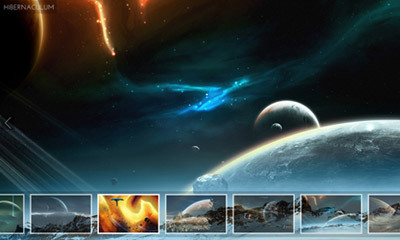 Just a question : the images you use for the demo ( the space images ) where did you take those ? Which type of license they have ? Can I just use it on my web site or video or something? Was crawling the web for days trying to find something with this functionality. The gallery currently resides under the Environment Design and Game Art tab. Fourth, Hoping our holiday season goes well Malihu and look forward to your response. You might try removing the 2nd jQuery (1.4) inclusion in your head tag and/or try placing all your scripts at the bottom (before the closing body tag) of your document. Sent me an e-mail with the details. Is there a way to change the speed of the thumbnails scrolling? I have many item and the movement is really fast. The only way to slow down it’s using smaller icon ? Not really. At the moment, the scrolling speed is determined by the cursor position, so your mouse movement sets the speed. You can only change the $scrollEasing variable and see how it affects scrolling. I’m planning on updating this gallery (in a couple of months) and implement a much more advanced scroller that will have additional ways of scrolling the thumbnails. Thanks a lot Malihu for your kindly reply . I was just trying that, but the result it seems not really good . This is really great ! A wonderful script can become better ? In Malihu’s house it’s possible ! Thanks , really; you’re doing a great job . I need help with my site or atleast the files that can be uploaded to run it correctly. Figured it out! It turns out it was just a jQuery conflict- wrapping the entire code in a noconflict wrapper settled things nicely. Thanks again for the great script Malihu! AWESOME Gallery! I’ve implemented it in the photo section of my website — http://www.DowntownDebauchery.com and it seems to be working just fine in Firefox, but in IE its a different story. If you could PLEASE look over the code and let me know if you can help me get it to work in IE it would be greatly appreciated. Thanks Malihu! How could i put a link in the background image? it is possible that, in the image description can install an external link? check the demo here. i like same right and left scrolling. first of all many thanks to the developer for creating this awesome image gallery and posting it up for free, for anyone to use. greatly appreciate the effort and the work done!! i was adopting it to use in one of my sites, and thought of tweaking it a bit so that it can pick the images to be displayed from a specified folder. so, i changed it into a php file and put in a few lines of code that will read a specified folder, file by file and output the correct code inside the html. this way, you only need to change one variable (the folder path) and it will display all images inside that folder in the gallery. i also modified the img tag a little bit to use a scaled down version of the same file as the thumbnail image (just coz i was too bored to create another file to use as the thumbnail). another modification i’m thinking of doing at the moment is, putting all the image captions into a single text file and then have the script display it line by line for each image. Thanks, Malihu, aren’t nearly enough — whether by great wisdom despite youth, or the kind-heartedness that experience too often hides, you’ve given a great deal of your time to helping others and, more importantly? Appreciating the efforts of others. I’ve probably less than you should already have comin’ in, and money ain’t as valuable as what I’m hopin’ finds you, but I’m gonna send you some of it anyhow. Good folks never seem to have enough time, but I’ll look into givin’ a bit of my own to “… add some back-end functionality” to this gallery, ’cause it’s far easier/better to build upon solid foundation(s) than to try ‘n fix what shoulda never been done. And, the price is *perfect* for this dirt-poor poor-dirt farmboy. Thanks a lot for your donation and more importantly, for your kind comments 🙂 I really appreciate your support. Nice Works dude, is there an autoplay option for it? Hi, Great script! I have a problem though, when I don’t give a title attribute to a certain image (as I don’t want to display a title with every image), it displays the title of the previous image, which has a title. Is there a way to fix this? Thanks a lot for the fullscreen gallery plugin, I am working on a site for a photographer and he is really happy with how this will showcase his work. I know you are super busy, but I am having trouble getting the next and previous buttons to move beyond the first and 5th image and not sure where I went wrong. I am also at a loss for the jQuery easing of the thumbnails on the iOS devices and wondered if you might have a suggestion on how to get that effect on them? Right now you can’t scroll past the last thumbnail. This is an amazing slider. but I wonder how we could add a transparent text description below the full screen image. Hey man, I’ve became great fan of yours, I’ve used the thumbnail scroller and now I’m playing with this gallery. Tell me something, I’m trying to embed videos (youtube/vimeo/etc) in the gallery so it will reproduce the videos in fullscreen, how awesome would be that huh?! But I tried some things and couldn’t get it to work, any thoughts? Thanks and congrats on your work!!! This is strictly an image gallery and doesn’t support other media (video, audio etc.). Loading videos would require a totally different script so there’s no quick or easy way of doing it. I’ll definitely create a video gallery in the future or maybe implement video support in this one. thanks! I’m a beginner at this so I was wondering if I put this on my website how do I add a [x] button so that the user can close the slideshow? This gallery is a standalone script so it doesn’t “close” (as there’s nothing below it). You can normally navigate to a previous/next page using browser’s back/forward buttons. I would like to see this feature ..